If you could, why didn't you? Why did the artist? An interesting response to the common reaction of "I could have done that" when people experience (modern, contemporary) art. 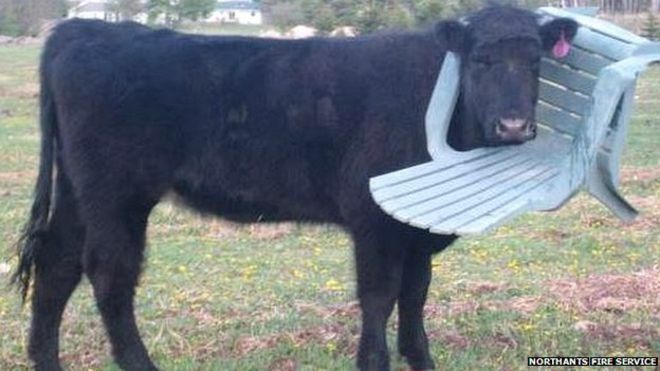 "It is not known how the garden chair came to be in the field or why the cow put its head through it." I will be at the Rail Yards Market in Albuquerque tomorrow, August 9 from 10am - 2pm. The market is located at 777 1st St SW [map]. There's lots of parking! More information about the Rail Yards Market can be found on their web site or on Facebook. Why didn't you go to the farmers market today? You stayed away from the farmers market this morning. Why? Congratulations! Your work is being noticed and appreciated! How did you do it? Your work is finally being recognized for its wit, artistry and sensitivity. What was the key to your success? Which character from hit 2016 film Jason Bourne are you? Which character from director Paul Greengrass's 2016 espionage action film best matches your unique personality? What will you do now that the 2016 political conventions are over? The thrilling political conventions of 2016 have ended, leaving you feeling empty and adrift. What will you do with your life now? How will you try to impress people in the interview? You have an interview for a job today. What will you do to impress your potential employers? Lots of Neat Stuff is the blog of Cristy Davies and Melvix (Dagwood Reeves). Something to say? Contact Melvix here. Copyright © 2003-2018 Cristy Davies and Dagwood Reeves.